Well known pastime for computer/video gamers and enthusiasts is case modding. It has gone so mainstream that gaming conventions now feature tournaments where modders lug their computer console when they compete for accolades and prizes. The only rule while modding computer is that you have to show creativity at fullest. Modded cases are typically made for computer towers, but recently it have moved on to modding a case for a 3D printer. 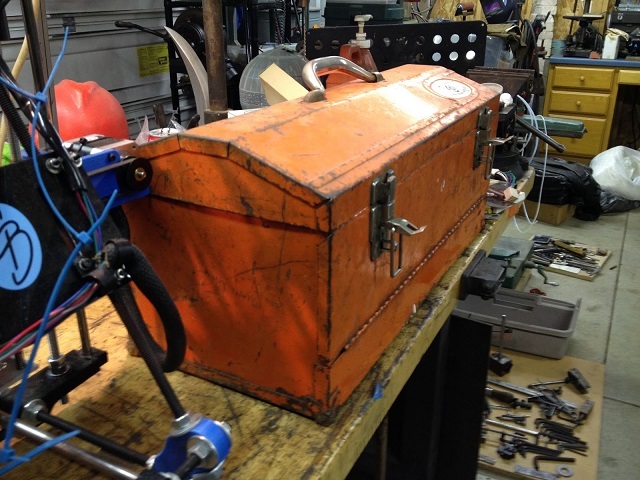 Boca Bearings, a miniature robotics supplier in Florida, had their custom 3D printed designs and fitted into an old beat Huot toolbox. Top of the toolbox opens up; the old repair kit’s front panel, which can be dropped making way for a perfect 6 inches by 9 inches printing bed, which can be moved along both the axes. When not in use the toolbox can be folded and it is portable can be moved around, no one will know the box actually contains a 3D printer which has working mechanism to print full plastic Yoda heads while on the move. 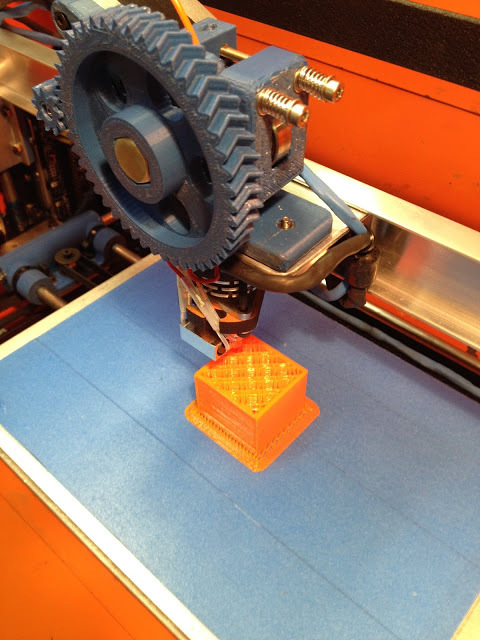 Chad from Boca Bearings – in order to make all parts fit into the toolbox, and also to make sure the printer work, he started by using appropriately sized design blocks to create a clone – a non functional basic printer. 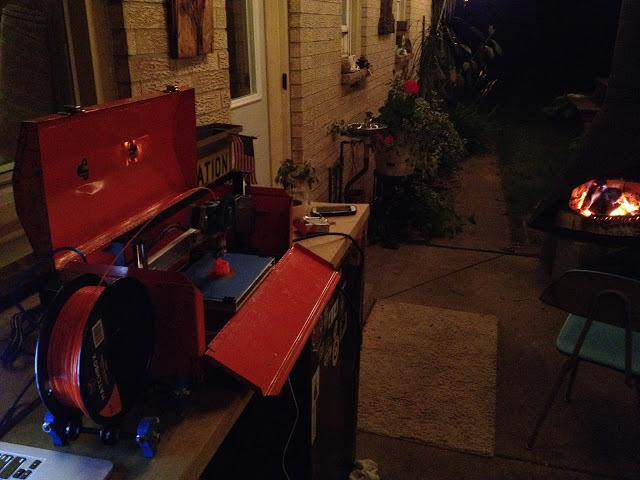 Chad envisioned and designed in way that, at the end he will fit in a functional printer with no waste parts or ruin a vintage toolbox which looks cool as well. The entire design and build was documented in four blogs detailing each step on Boca Bearings’ website, where Chad demonstrates each step of the fabrication process while walk through, details include how to go about components being 3D printed, power coating a frame and Chad has also demonstrated redeploying a shower track while moving the hot edge along the z-axis. When Chad had a realistic and working wireframe that seemed to allow full movement, he focused on Rhino3D to build and design a more realistic mould for the 3D printer. He used a 3D model to keep track of measurements, dimensions and allowances; it helped him to try various permutations and combinations until he arrived on the right build. 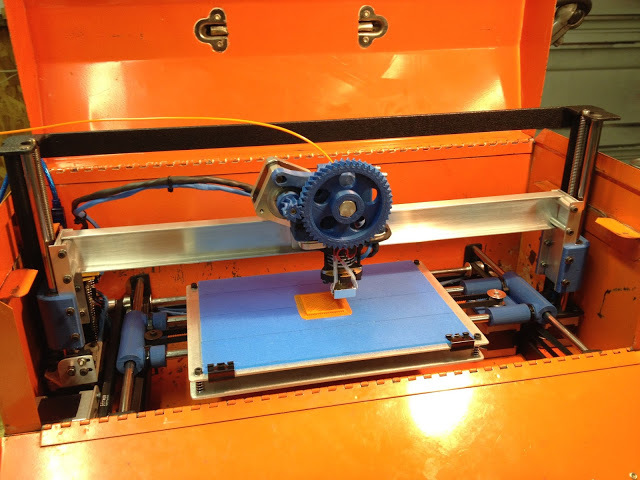 The design evolved, made the fabrication process much easier and smoother to build the X axis & Y axis, plastic components were 3D printed on his shop’s MakerBot 2x, custom construct made the printing bed with little need for revision. 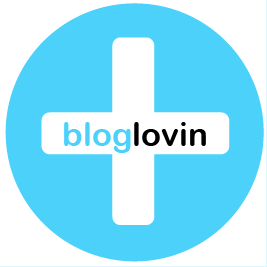 “Two sheets of aluminum were used for the bed; sheet on the top will act as print bed firmed by four springs that are attached to an aluminum sheet below. I put to use my 1930’s Delta bandsaw to cut my early Delta and Hamilton drill presses which I used for mounts. To mark holes, I used a divider at equal distance to make sure the holes are lined up correctly. When I was done drilling the bottom platform, then I used the drill press to assist in tapping the holes manually,” explained by Chad in his build log. Chad’s vintage tool box after decades had scratches, dings and dents, he wanted to keep intact the vintage character of the toolbox after finish as much as he could. So, while he was modding he covered other area with painter’s tape where he was altering the part. He also made use of welding leathers which were strategically placed to prevent metal dust and stray sparks from damaging the vintage box while modding the frame. Once Chad done with the fabrication, he simply was left with some minor work, wiring various printer parts, run the print and finalizes the final calibrations. Chad working with Boca Bearings gave him access to all sorts of minute machine parts and wiring which kept every part in place. To juice up the toolbox he installed Lulzbot power supply for 3D printers, he then punched a small hole in the side of the box for the power cord to stay intact even if the box was closed. 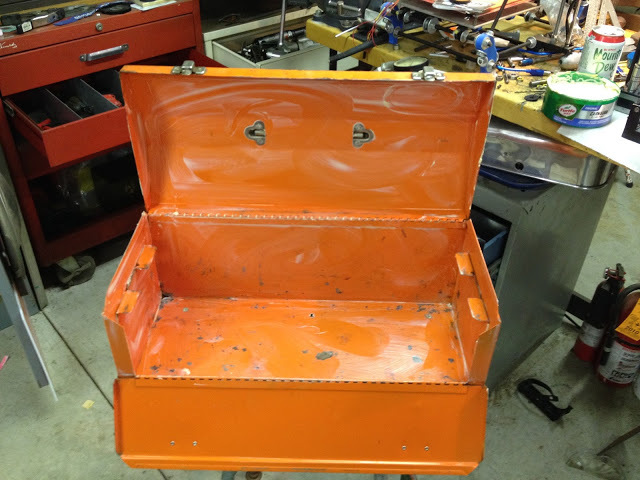 The completed final toolbox exactly works how Chad imagined it working, while it does not produce the detailed parts that we’ve seen from other costly professional 3D printers, but the outcome isn’t bad for a vintage toolbox based custom machine. While Chad is still at work to tweak the printer by tightening some nuts and pulley, which will improve the print quality. Boca Bearings’ blog is being updated with whole build process and you can also watch the whole episodes of design videos on Chad’s YouTube page.